Most U.S. adults now say it is not necessary to believe in God to be moral and have good values (56%), up from about half (49%) who expressed this view in 2011. This increase reflects the continued growth in the share of the population that has no religious affiliation, but it also is the result of changing attitudes among those who do identify with a religion, including white evangelical Protestants. But the continued growth of the “nones” is only part of the story. Attitudes about the necessity of belief in God for morality have also changed among those who do identify with a religion. 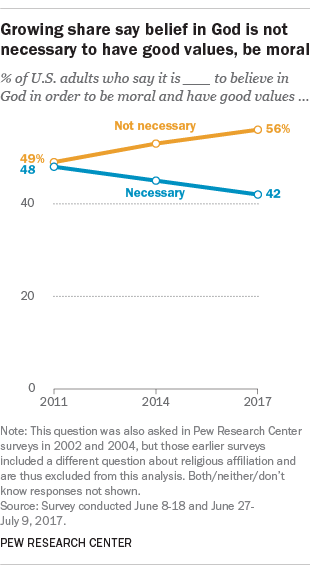 Among all religiously affiliated adults, the share who say belief in God is unnecessary for morality ticked up modestly, from 42% in 2011 to 45% in 2017. 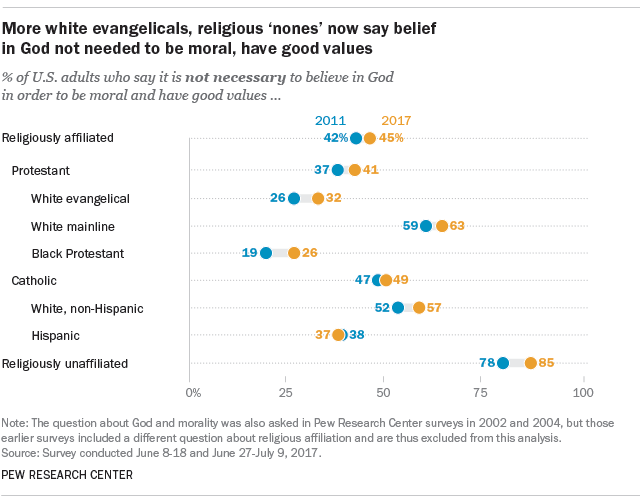 Among white evangelical Protestants, 32% now say belief in God is not necessary to have good values and be a moral person, up from 26% who said this in 2011. To be sure, most white evangelicals still say belief in God is necessary for morality. But the share who say belief in God is a necessary underpinning of being moral has declined from 72% to 65% in just six years. Religious “nones” themselves, in addition to growing as a share of the population, have simultaneously become more likely to reject the idea that believing in God is necessary for morality. In 2017, 85% of religious “nones” say belief in God is unnecessary for morality, up from 78% who said this in 2011. The trends in opinion on this question also point in the same direction among white mainline Protestants, black Protestants and white Catholics. Recent changes among these groups, however, have not been statistically significant.